Access to accurate legal information is of great importance. Certainty of the law, creating the conditions necessary to equality and fairness in a legal system and improving the functioning of democratic institutions, depends upon it. Citizens have a right to information about the laws which govern their conduct and governments have an obligation to enable access to the law by means of all available and practicable tools. 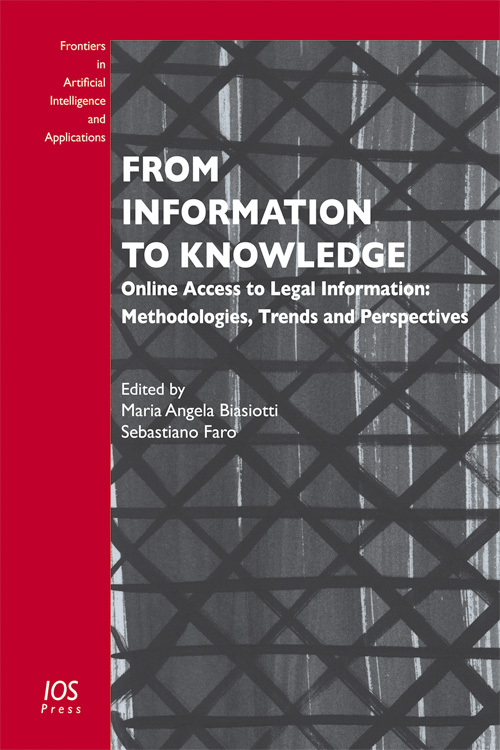 This book presents papers delivered at the workshop ‘From Information to Knowledge - Online Access to Legal Information’, held in Florence, Italy, in May 2011. This workshop brought together experts and research groups with international experience and expertise in realizing effective access to online legal information. The book explores theories, methodologies and experiences which focus on enabling access to legal information via the Internet. The first section presents contributions which address the issue from a modeling and theoretical point of view, while the second part deals with initiatives and projects which enable access to legal information from different approaches, and by the implementation of various methodologies and tools. This book will be of interest to all those involved with the dissemination of legal information and the exercise of the rights of citizenship of EU citizens. Edited by: Biasiotti, M.A. , Faro, S.